This could be the finest pillow cover I've ever seen! Truly rare and wonderful in every way! I believe the fabric on the back of the pillow slip is silk! Museum quality! The bottom is open, as you can see, ready to insert your pillow form. The back of the pillow is a green velour material. Zipper closure. Very retro and cool look! Pillow is back with designer wool mohair fabric. 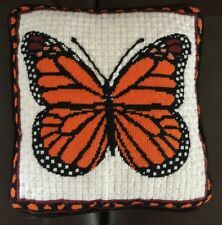 Vtg 60’s Needlepoint PILLOW Monarch Butterfly Felt Backing Metal Zip 14" X 13"
Vibrant Monarch Butterfly. Various Textured Stitches. Black Felt Backing. Clean excellent condition. I try to describe any obvious faults as truthfully as I can. Condition: original as found. Very good for its age. Features a beautiful designer jacquard fabric in soft gold on front and back. I used a gold gimp trim around the needlepoint and surrounded the entire pillow in a 3 color onion ball trim. The entire pillow is lined for durability. Vintage Needlepoint Decorator Pillow Featuring Lovely Rose Design/ 20" X 20"
The back of pillow is a plush crushed velvet in gold. I lined the entire pillow for added stability. There is a hidden bottom zipper for ease of removing the down/feather insert if needed. 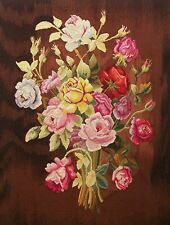 Vtg Style Aubusson Pillow Pink Roses Beige French Style Needlepoint Cute pillow but it does have a stain on it see photos. 25x16.5. Good condition with a few loose threads and some spots on the back that may come up with cleaning. Zipper along the seem to remove the pillow for cleaning. Free Shipping. Sanderson, Chinoiserie Toile accent Pillow. colors are Indigo/blue, 49% Linen 38% cotton 13% nylon drapery upholstery. blue strip upholstery velvet on back, finished with invisible zipper. Scalamandre embroidered morie dark blue accent fabric on top and bottom. PINK and WHITE TICKING FEATHER PILLOW, 1930s/40s, 23" x 17"
Nice and fluffy! See pictures. 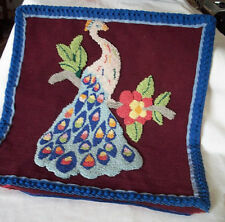 Large Katha Diddel wool needlepoint pillow. Feather pillow insert included. If you would like only. In great condition, no stains or holes. Black background has golden, toile by Kingsway fabric. beautiful accent trim, very thick brush fringe all around pillow. accent fabric: Dupioni 100% gold silk embroidered Fleur De Lis. removable insert included, filled with 100% polyester fibers. Chinoiserie Toile. The pillow made with 100% cotton handprined Chinoiserie toile. Scalamandre, "Shanghai". accent Pillow. golden beige velvet on back, finished with invisible zipper. there are many beautiful accent trims, Cord on top and bottom, bullion fringe on side. CRIMSON TAFFETA ON THE BACK AND WELT. DESIGNERS TRIM. APPROX 24" X 24", DOWN/FEATHER BLEND, ZIPPER. Lee Jofa, "Chinoiserie Staircase" designer accent Pillow. glazed 100% fine cotton, by Lee Jofa, collection made in England. Blue background has dark green, blue, gold, red, pink, white and more. Has a stain and soil finish application. platinum collection by Richloom. Pillow made with 100% cotton high quality drapery upholstery. removable insert insert included, filled with 100% polyester fibers. Pillow made with 100% cotton French Script & Rooster high quality drapery. There are many beautiful accent trim, cord on top & bottom. accent fabric: cream color 100% silk on top & bottom. Colorway: two tone cream background has brick, red, deep blue, green and more. Have been used and are in well respected condition. Zipper closures work smoothly. Cold water laundered. Stroheim & Romann "Cathay Pastoral". brick red 100% cotton Chinoiserie toile. by Stroheim & Romann. accent Pillow. removable insert included, filled with 100% polyester fibers. accent fabric : Lotus florals upholstery cut velvet. Vintage Antique Ticking Pillow Bolster pink roses 20" x 53"
Vervain "Taiping Palace" chinoiserie Toile accent Pillow. Pillow is made withglazed 100% fine cotton Chinoiserie toile. brown velveteen on back. finished with invisible zipper. accent fabric: brown velvet,there are many beautiful accent trims. Charming CATSTUDIO hand embroidered pillow. good condition, no insert. A very pretty vintage needlepoint pillow...in a dark blue background with big red apples with green leaves on a branch...the pillow measures about 14" square...the back is a dark blue velvet...in great condition on the needlepoint...the pillow is corded with fancy corners...the cording is a little worn and faded...the zipper on the back is broken...sure to add a vintage garden touch to any room in your home or cottage! Gilded Paisley onCardinal red Velvet foundation. 100% cotton high quality upholstery by Beacon Hill. made in Italy. accent fabric: antique gold Dupioni Silk on top & bottom and sides. golden brown red undertone velveton back ,finished with invisible zipper. Beautiful Urban Outfitters design. 21” Square. ALL COTTON FABRIC - Soft Twill. Barely ever used, beautiful condition. Hidden zip closure, 17.5 x 18". Here is a rare find -- two beautiful tapestry pillow covers from the famous French house of Jules Pansu (founded in 1878). COORDINATED COLOR SILK FABRIC ON THE BACK. APPROX 24" X 24", DOWN/FEATHER BLEND, INVISIBLE ZIPPER. It looks like a very rustic osnaburg cotton ground which the picture nots is very frayed. The cat in is cut from a minty green gingham and the bow is a faded red cotton. The embroidery is in good shape except at the top of the head. All cotton covering. 25" x 16" No holes, stains or foul odors noted. From an estate. MID-CENTURY MODERN VINTAGE ORANGE TRIANGLE THROW PILLOW 12"x12"x12"
No labels. Stuffed with original triangle shape foam piece. No holes/stains. Very good, clean, odor free condition. Nice old Yo Yo pillow. 2 small places that could use repair as shown in photos. Vintage YoYo Pillow 11” Square. Condition is Used. Shipped with USPS First Class Package. Scalamandre, "Venetian Carnival". Pillow made with 100% cotton chintz high quality drapery fabric. accent Pillow. fancy curly fringe all around pillow. removable insert included, filled with 100% polyester fibers. Scalamandre, "Venetian Carnival". Pillow made with 100% cotton chintz high quality drapery fabric. accent fabric: yellow & pumpkin stripe drapery upholstery. accent Pillow. removable insert included, filled with 100% polyester fibers.